A release candidate of Windows 7, the next major release of the world's most popular operating system, goes public in trial form in the next week. Microsoft is hoping it can avoid the negative press that surrounded the launch of Vista, the last major Windows release, almost three years ago. Windows 7 has been designed to be compatible with Vista so users do not have to invest in new hardware. 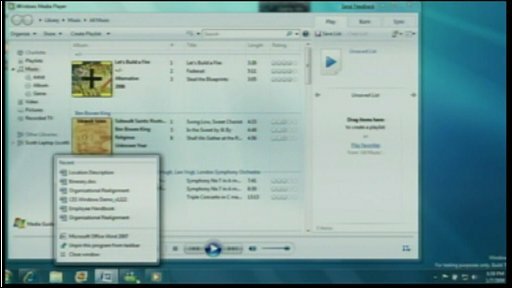 A commercial release of Windows 7 is expected in the next nine months. A test version of Windows 7 will be available to developers from Thursday, while the public can try it out from 5 May. John Curran, Microsoft UK's director, Windows Client Group, told BBC News that "shortfalls" in the Vista release had caused problems for some users. "There were challenges on hardware and application compatibility with Vista in the first couple of months - and that has left a little bit of an aftertaste for a segment of people." When Vista was launched many users expressed frustration that the operating system did not work with all types of existing hardware and peripherals, or programs used commonly on PCs. And a Vista compatibility programme for hardware proved to be confusing and, in some cases, somewhat misleading. Mr Curran said Microsoft had "learned lessons" and had been working with partner developers to ensure the same mistakes would not be repeated. Windows 7 will also have "comparable system requirements" to Vista, which should mean that if your PC is capable of running Vista it will also run the new version. Mr Curran said Vista had proved to be a success for Microsoft, despite the negative press that surrounds the operating system. "Vista is the fastest selling operating system of all time and, in percentage terms, enterprise moved to Vista faster than it did to XP [an earlier version of Windows]," he said. He said satisfaction surveys for Vista showed 90% of people were either satisfied or very satisfied and 85-90% would recommend it to a friend. Microsoft embarked on a major advertising and marketing mission to improve the image of Vista after the muted reaction around its "The Wow starts now" campaign. While Vista was released five months after the release candidate was made available, Mr Curran said Windows 7 would only be released when it is ready. "Obviously in these times everybody is keeping an eye on the bottom line, but we are certainly taking a longer-term perspective here and always have done with Windows franchise. "The timeline stated all along is that we are targeting Windows 7 within three years of of the launch of Vista and that would be the end of January 2010. "We feel quite confident we are on trajectory that will deliver on that promise. But the exact timing will be based on quality." Windows 7 promises a major usability improvement on Vista, and a simplification of security measures which caused frustration for many users. Mr Curran said Windows 7 would build on the security improvements in Vista, which have seen a fall in the number of malware attacks and critical vulnerabilities identified. Many beta testers of Windows 7 have reported that it is faster than Vista, especially in terms of start-up and shutdown sequence of the computer. Mr Curran said that the Microsoft Windows team had been poring over every aspect of the operating system to make improvements. "We were able to shave 400 milliseconds off the shutdown time by slightly trimming the WAV file shutdown music. "It's indicative of really the level and detail and scrutiny on Windows 7." A version of Windows 7 will also be available for netbooks, but with some caveats. The Windows 7 Starter Edition will have limitations on how many applications can be used concurrently on a machine in order to preserve performance.